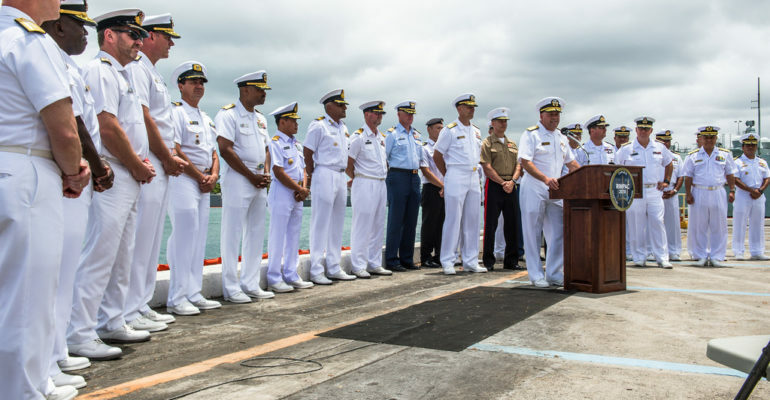 Vice Admiral John Alexander, Commander of U.S. 3rd Fleet, and multinational participants at the opening of RIMPAC 2018. As we celebrate independence tomorrow, we recognize the importance of dependence on each other as nations to keep our world safe, as was announced last week in Hawaii with RIMPAC and today with our NATO allies in sharing the burden of defense. “It will, however, become increasingly difficult to justify to American citizens why some countries do not share NATO’s collective security burden while American soldiers continue to sacrifice their lives overseas or come home gravely wounded,” President Donald Trump wrote in a letter to German Chancellor Angela Merkel. The United States hosts the 26th Rim of the Pacific Exercise (RIMPAC) with 25 nations that runs until August 2nd. RIMPAC is a biennial exercise. NATO is a 29 nation member alliance, made up of European nations, Canada, and the United States with a collective defense agreement, under Article 5 of the treaty, and hosts multiple annual exercises amongst their nations. All of these dependent nation relationships built on trust across the Pacific and the Atlantic are critical in keeping our world a safe place and deterring those that seek to disrupt the world order. Integrated Air and Missile Defense (IAMD) is one of the key interoperable capabilities shared amongst nations and across domains on various platforms to defend and deter, and one that continues to evolve and be built upon. During RIMPAC, the United States, the Republic of Korea and Japan will exercise their interoperable IAMD capabilities together across the various domains from ships at sea, land systems, and air/space assets to sense, track, and shoot down a cruise missile threat representing the capabilities that both the Pacific and NATO face in today’s world. Dependence on each other is based on the development of exceeding trust propelled by respect into relationships that forever unite.